Lovers of great magic tricks were thrilled with our Easy Card Tricks post. To say thanks, we’re going to share the Complete Training Plan we use to help our magician coaching clients take the fast lane to magic tricks that can astound any audience. Enjoy! This is Part 1 of our Complete Card Magic Blueprint. Have you ever spent countless hours practicing magic, only to give up in frustration? Or seen so many versions of a magic trick, you spend all your ‘magic time’ just trying to decide what to practice? 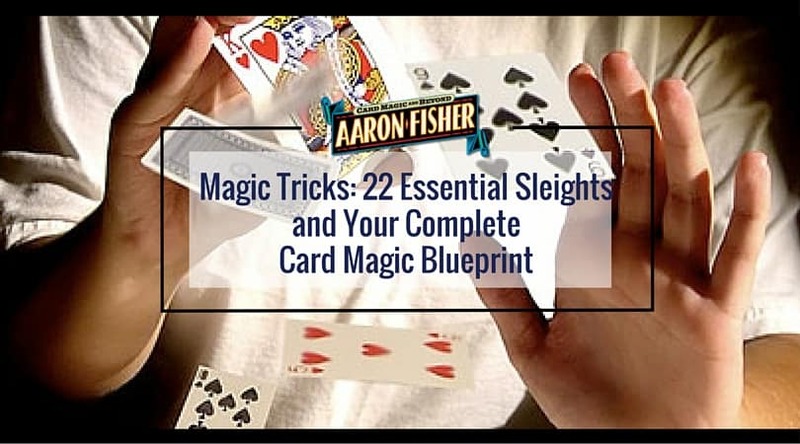 If so, this Card Magic Blueprint is for you! Just by reading this plan, you’ll get more results from every minute you spend with cards, and all of your magic tricks will astonish like never before. As you go through this plan you’ll see a few techniques you’ve already heard of, and maybe some you already use. But this is not a mere collection of useful sleights & magic tricks. Far from it. In fact, many sleights you may have considered irreplaceable do not appear on this list at all. The truth is, most of the popular sleights you’ve been told you need…are simply unnecessary. That’s right…you don’t need them to become an astonishing card magician. However, there are some very specific skills you DO need. Without them you won’t get far. With them, you’ll have the framework to create any miracle you can imagine. This plan will list the exact skills that really make it happen, and show you how each and every one fits into the big picture of your own miraculous card magic. The secret is not just to do the right things, but to do them in the most effective order. Focus on the first items first. They’ll build your skills quickly, and ensure you get maximum results from every minute you spend on your magic. As you go through the blueprint, pay special attention to items you have never carefully considered before. In most cases, these will be easy-to-acquire ‘micro-skills’ that accelerate your progress in surprising, exciting ways. The later items on this blueprint build directly on the earlier ones. Focus on the first skills first. You’ll find even the most ‘difficult’ sleights in the plan surprisingly easy to master! So let’s start at the very beginning. To build the foundation for card magic miracles, you’ll need to “Build Your Card Magic Operating System”. Close your eyes and say the magic words “magic tricks, magic tricks, magic tricks”. The Natural Dealing Position is the ‘launch position’ for every single thing (magic tricks & sleights) you do with cards. 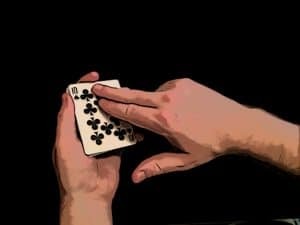 Everything from dealing the cards cleanly off the deck, to the Double Lift and the Classic Pass depends on the specific finger positions you use to hold the pack. The Natural Dealing Position must become your normal way of holding the cards. When you hold the cards, do it in Natural Dealing Position and you’ll see an immediate improvement in all of your card magic. You can test this right now. If you haven’t already, grab a deck and check out our recommended 7 Point Natural Dealing Position. Does your current grip match up perfectly? Remember, every one of the 7 points can make or break your card magic! 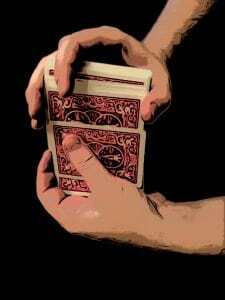 In most cases, when you find a sleight challenging or ‘unreliable’, the issue can be traced directly back to how you normally hold the deck. In the article, you’ll see how each of the 7 points plays a pivotal role in your success…even sleights you would never expect! Your Shuffle System creates the ‘background’ for everything you do with cards. We recommend the Overhand Shuffle and the Overhand Shuffle Control as the ideal choices. 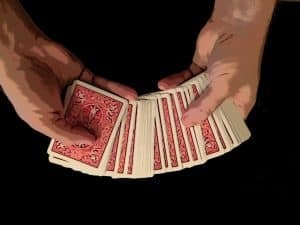 As you examine the world of card magic, you’ll find almost every type of shuffle can be used to control cards, from riffle shuffles to dovetail shuffles and more. 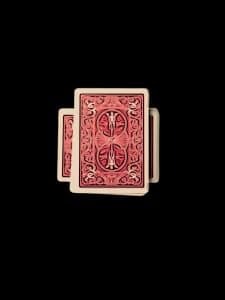 The following tutorials will help you master your card magic tricks by getting your Shuffle System up to speed. Since this is the basic foundation of many magic tricks with cards, you should spend some time with these videos. The One Card Push off is just what it sounds like: your ability to use your thumb to push a single card off the deck or packet, and only a single card, every time. Why focus so much attention on a ‘move’ that isn’t even a move? This little idea is a VERY big deal. It’s so easy to push a card off the pack, in theory, that most magicians we meet with have never given it any consideration at all. After all, anyone can do it, so why should it matter? The real ‘skill’ here is to make sure that only one card gets pushed every time. When we perform many tricks, it doesn’t matter how ‘cleanly’ we push off a card. We use our left thumb to push a card off the deck, and maybe one or two more come with it. We use the right hand to remove only the card we need and that’s the end of it. But if you’ll take a few minutes as you practice to pay special attention to this detail, you’ll be able to push off one card, and only one card, every single time. All become much easier to practice and perform with total confidence…if you start with the easy to master, but crucial One Card Push Off in your toolbox. 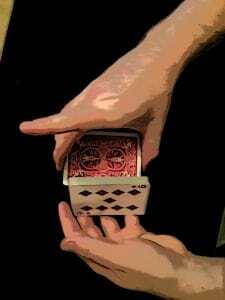 Three kinds of selection procedures power virtually every card magic trick. Don’t make the universal error of practicing sleights like double lifts or forces before first becoming aware of The Big 3. 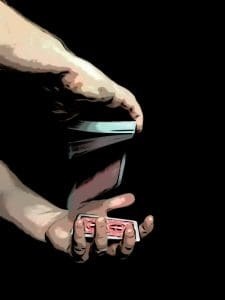 Like your Natural Dealing Position, how you have a card selected and replaced can make or break your magic before you finish a single trick. 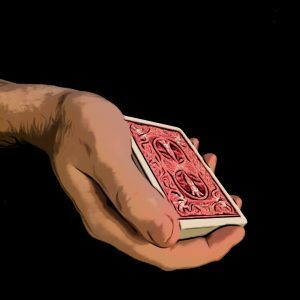 The Left Thumb Riffle – When the cards riffle off your thumb as you ask someone to call ‘stop’, it makes for a very clean, convincingly natural, selection procedure. This Selection and Replacement Procedure feels as fair as can be. It actually disarms your spectators. Since they only need to replace their selection where it first came from, they never even consider ‘challenging’ you. The Left Thumb Riffle is also the easiest of the Big Three to master. For those two reasons, we recommend you practice the Left Thumb Riffle and make it your first ‘go-to’ selection/replacement procedure. The following tutorials will give you everything you need to master the Left Thumb Riffle. Watch this video and learn how this works… and you will absolutely love using it with your magic tricks! Spreading the cards between your hands is the most common way to have a card selected. 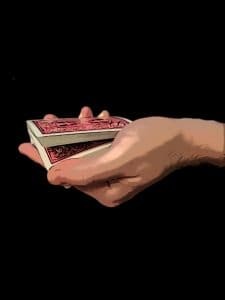 Just about anyone can spread the cards well enough to say ‘take any card’, but if you practice spreading the cards softly and smoothly between your hands, the audience will sense the freedom you promise. And that’s just what you need to do if you want to stop suspicion before it arises and pave the way for miracles. If your spectator doesn’t feel the freedom when you say ‘pick a card’ you’re sunk. Even if you aren’t using a ‘force’, it doesn’t matter – they audience will feel like you are. Oddly enough, this phenomenon doesn’t even require the spectator to know that ‘card forces’ exist! A soft, open spread also keeps ‘air’ in the cards, and that makes just about any sleight easier to do. The Dribble is the third and final Selection and Replacement Procedure you’ll eventually want to add to your toolbox. It’s very disarming, displays the selection (on the face of the right hand packet) to the entire audience at the same time and makes for an incredibly convincing card force. Thanks to it’s appearance, the Dribble can disarm an audience as much, or even more, than the Left Thumb Riffle. However, it is slightly more challenging to do. We hate it when passionate magicians sit on the sidelines waiting to master a ‘secret move’ when they could be out amazing people with an effective substitute. For that reason, start using the Left Thumb Riffle immediately. In just a few months, you’ll be able to Dribble the cards as well. You’ll have access to all of the Big 3 Modes of Handling, and you’ll have smooth sailing every time you say, “pick a card!”. Be warned: Once you get comfortable with all of the Big 3 Modes of Handling, The Dribble may be your ‘go-to’ favorite for life! Two of the three ‘must have’ sleights you’re about to meet take less than a single moment to accomplish. That’s a good thing, because that’s precisely how long you can direct a spectator’s attention away from your hands without them noticing at all. In addition, these three sleights are also among the easiest secret moves in magic. But don’t overlook them. 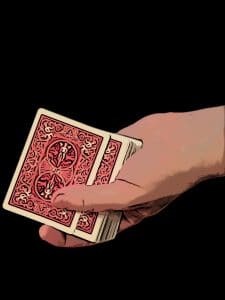 These three simple moves, combined with your Overhand Control System and your favorite Selection and Replacement Procedure, allow you to perform at least 80% of the greatest card miracles ever devised. Crossing the Cut is a secret card force that is truly sleight-free. However, that doesn’t mean it’s ‘self working’. In fact, our clients have consistently found this force to be the easiest, fastest way to master the fundamentals of expert misdirection. When this super easy force is performed well, it’s amazingly effective! Amateurs often overlook this force, but top professionals around the world have used it for over a hundred years to create miracles without relying on sleight of hand. Do yourself a favor and learn the Crossing the Cut Force. You will use it for years! Watch this short video tutorial and see for yourself! The Braue Reversal takes more than a single moment to perform, but in this case that’s ok because it’s not a secret action at all! It’s also the easiest secret reverse to master…and the one you should start using right away. The reverse is made under the perfect cover of a simple, though slightly fancy, cut. And with this little tool in your box, you’ll be able to force, switch or magically reveal a selections in many astonishing ways. It’s the best secret reversal to start with because it’s the easiest one to learn and use with success and confidence. The Two Handed Glide allows you to display a card on the face of the deck and secretly to switch it for another card as it’s placed on the table. Many magicians dismiss this powerful weapon and go right for the Double Lift or Turnover. I suggest you don’t make that mistake. The Two Handed Glide looks incredible natural. It’s very disarming, and best of all, it’s a LOT easier to master than any Double Lift or Turnover. Plus, unlike the Double Lift or Turnover, the Two Handed Glide only takes a single moment to do…so it’s very easy to misdirect. No matter how many ways you can switch one card for another, this one is the most fundamental sleights to your success with magic tricks. Even after you can perform a masterful double turnover, you’ll still use the Two Handed Glide all the time. What’s Next With Your Magic Tricks?? Integrate and Level Up! Congratulations! You’ve already accomplished more in the time it takes to read this article than most magicians do in a lifetime! You’ve developed a complete system of card magic that allows you to perform nearly every effect in card magic – from the Ambitious Card (Glide and Overhand Shuffle) to visual full deck reversals (The Overhand Shuffle, Braue Reversal). You can perform spelling tricks, mental divinations, direct mind reading miracles and even visual magic. Nearly every effect in card magic can now be yours. 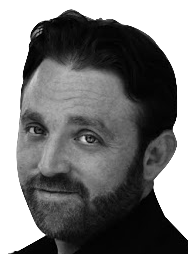 Just by performing simple, amazing magic tricks with the sleights we’ve already discussed, you’ll master the ‘micro-skills’ buried in them. And you’ll do it with little or no conscious effort. As a result, you’ll find advanced sleights surprisingly easy to learn… and all card magic tricks will come easier and faster. The One Card Push-off and the Hand to Hand Spread provide the foundation you’ll need to execute flawless Classic Forces and Spread Culls. The Criss Cross Force provides the strongest training we’ve ever found for the Misdirection that powers No-Fail Double Turnovers, The Invisible Pass, the Top Change. Left Thumb Riffles and Dribbles are the most challenging, foundational parts of the Riffle and Dribble Forces. The Two Handed Glide provides the framework you’ll use to perform invisible Class Passes, Top Changes, Palms and Side Steals. I’ll show you exactly how to use your new skills to raise your magic tricks to new heights. I’ll show you exactly how to attack the next stage so you achieve mastery without the frustration. You’ll also discover the secret that unlocks the entire Second Stage of the Card Magic Blueprint. And as you’ll see, this secret is so small that most magicians never even notice it. 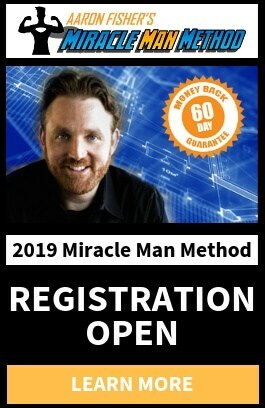 I’m going to show you what that secret is – and how you can use it to master any sleight or magic trick you choose.